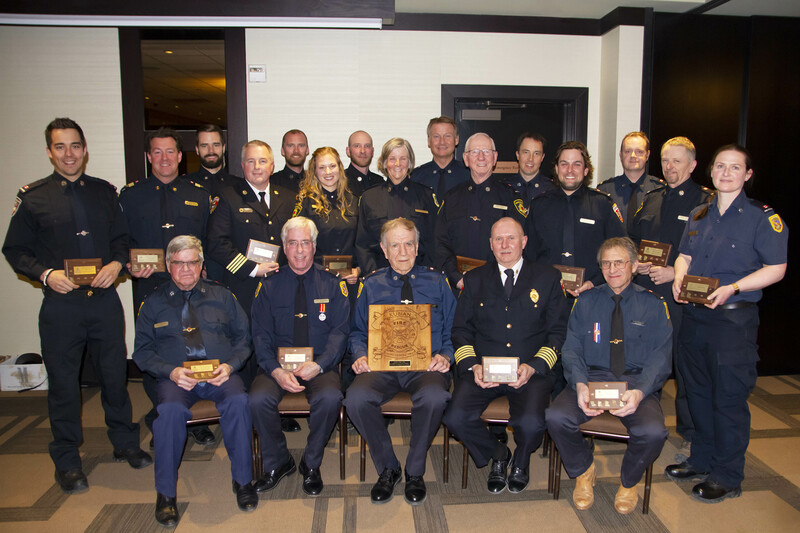 The Columbia Valley Rural Fire & Rescue Service (CVRFS) hosted its annual appreciation banquet Wednesday night and presented a number of service awards. Members were recognized for five, 10, 15, 20 and 25 years of service to the Edgewater, Panorama, Windermere and Fairmont Fire Departments. The longest-standing member to be recognized was Murray Kubian who received a standing ovation as he was presented with a special plaque in honour of his 36 years of service. “Murray is retiring this year and we will certainly miss his experience and influence. He is an expert on our pumps and role model firefighter. From day one he has been a dependable, dedicated member and we wish him and his wife the very best,” adds Miller. The banquet was held at Copper Point Resort and brought all four departments together for one evening of celebration. Back row: Kyle Flynn, Jason Smith, Nathan MaCabe, Drew Sinclair, George Porteous, Michelle Porteous, Jay Wilisky, Wendy Rockafellow, Ken Becker, Heinz Meyer, Bram Rossman, Spencer Cotie, Jon Tames, Keith Andestad, Ellegra Newill. Front row: Eric Falkenberg, Scott MacDonald, Murray Kubian, Jim Miller, Dave McCarthy.